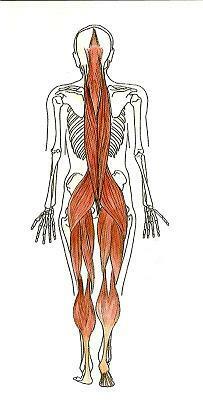 Bowen involves gentle, yet powerful, movements on muscle and connective tissue. These movements prompt soft tissue release, sending neurological impulses to the brain. Because the impulses travel through the internal nervous system pathways, they stimulate whole brain responses, which address every system in the body – internal organ systems as well as musculo-skeletal strcture. These moves also increase blood and lymph flow. 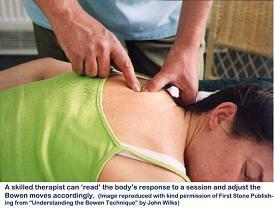 A Bowen treatment lasts about an hour, but can last anywhere from 15-90 minutes. No oils are used. Treatment can be done through clothing or directly on the skin. There is no forceful manipulation, just a light cross-fiber maneuvering of a muscle, tendon or ligament, pleasant to the recipient. The moves are done in groups. Between sets, there are two-minute breaks, which allow the body to achieve energetic realignment without interference, and enter a profound relaxation. This deeply relaxed state seems to act upon the body’s autonomic nervous system, which creates homeostasis at the cellular level. Because it addresses the body as a whole, Bowen treats beyond the presented symptom and makes physical, chemical, emotional and mental adjustments within each system. Bowen facilitates the balancing of a broad range of conditions. It can address any problem (with medical supervision where appropriate), as the treatment is holistic. People with chronic disabilities such as chronic fatigue syndrome, multiple sclerosis, fibromyalgia, cerebral palsy, muscular dystrophy and arthritis have been known to show a gradual improvement in the condition and quality of life. If someone has not responded to other forms of treatment, it is always worth trying the Bowen Technique, because in many cases it has been known to trigger sometimes surprising and unexpected recoveries when nothing else has worked. For more information, see: BowTech.